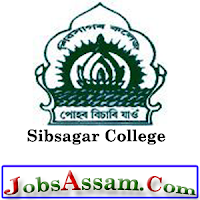 Applications in Standard Form are invited from the intending candidates for filling up the following sanctioned posts of Sibsagar College, Joysagar. Age: The upper age limit for all posts is 43 years as on 01-01-2018 with relaxation of 5 years for ST & SC candidates. For Assistant Librarian, candidate must have Bachelor Degree in (Arts/Science/Commerce) from a recognized University. The degree of B.Lib and Information Science is desirable. For Junior Assistant, candidate must have Bachelor Degree in (Arts/Science/Commerce) from a recognized University. Selection Procedure : For both the posts there will be a Computer Test in both English and Assamese and a separate Written Test. The selection procedure will be as per the “Assam College Employees (Provincialisation) Rules 2010” & Guidelines issued by DHE, Assam. Note: The candidate must have Permanent Residence Certificate.